I found a hundred-year-old recipe for Browned Whole Onions that is lovely with a hearty pot roast, game, or other flavorful meat. The onions’ robust flavor nicely complements the meat. These onions are firmer than the sliced browned onions that are often served today–and they are not at all like the breaded onion “flowers” that restaurants sometimes serve. Instead they have a delicate outer browned layer, and firmer but delicious inner layers. Preheat oven to 400° F. Peel onions, place in a large saucepan, cover with water, then add 1 teaspoon salt. Bring to a boil, and then reduce heat and simmer for 15 minutes. Remove from heat and drain onions. In the meantime combine the flour, 1/8 teaspoon salt, and pepper in a small bowl. Dust the onions with the flour mixture. Place the bacon drippings or olive oil in an oven-proof skillet, then add onions. Pour 1/2 cup water into the pan along the edge. Place pan in oven and bake for approximately 25 minutes. Remove from oven, and gently turn and roll the onions in the dripping in the bottom of the pan. If needed, add additional water. Return to oven and bake for an additional 15 minutes or until lightly browned. (The amount of time is dependent upon onion size. 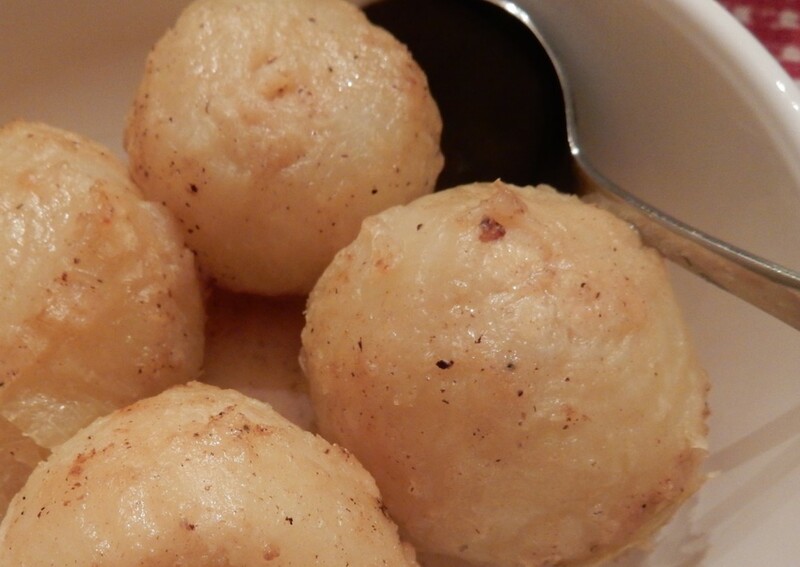 Larger onions may need to be rolled in the drippings a second time and cooked a little longer.) Remove from oven, and place browned onions in serving dish. Add 1/2 cup water to the drippings in the skillet, and scrape the bottom of the pan to loosen any flour or cooked pieces of onion. Place on a burner, and bring to a boil while stirring constantly. Reduce heat and cook a few minutes until the mixture has thickened slightly. Spoon the “gravy” over the onions and serve. Posted on March 7, 2016 March 8, 2016 by SherylPosted in FoodTagged onions, recipe. I love onions, and this would be a lovely, “special” side dish. I’m going to give it a try for myself, just to see how it works. Then, I’ll have it on the list for company dinners. The size of the onions affects how long they need to be cooked. If you make this recipe, you’ll have to let us know how it turned out. I just love the way your blog transforms the old into new ideas. These onions would be a great complement for many meals. I have a lot of fun trying to “translate” the old recipes so that they will work today. It’s wonderful to hear that you enjoy it. 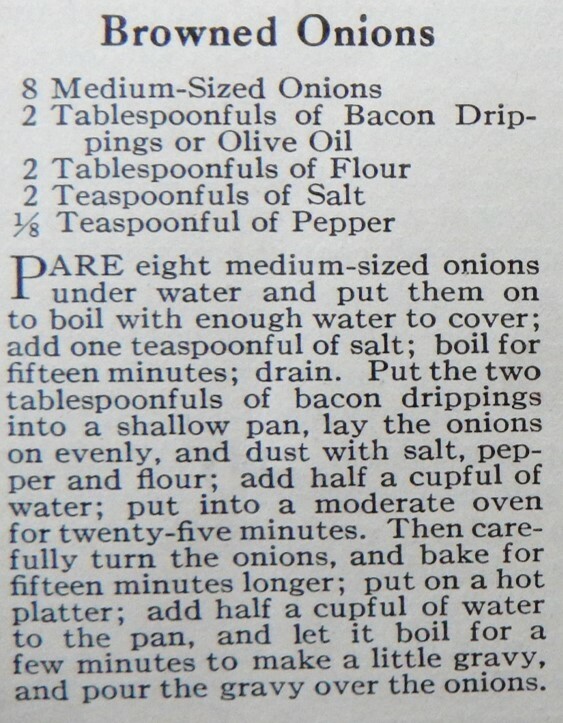 My family loves onions, I think they would enjoy this recipe. It they like onions, I think they’d like this recipe. Thanks for sharing your updated version of the onion recipe. It does sound like the perfect accompaniment to a Sunday roast dinner. It would be very nice with a Sunday roast dinner. They look really good. I thought they would be done in a fry pan, but oven makes it much easier. The texture of the inner layers of onions is firmer (and the onions hold their shape better) than what I think they’d be if the entire cooking process took place in a frying plan on the top of a stove. Sounds very interesting. I love onions. This does sound like it would be good with a nice roast beef or even pork. And I have a pork roast to cook this week! Interesting recipe! They would go well with that pot roast! Yes, I think that this recipe works best an an accompaniment of some of the more flavorful and richer meats. Again, another new (to me) dish. I agree that these would be great with a pot roast! I find it amazing how many hundred-year-old recipes are “new” to me. Such an intriguing recipe! Never seen anything like it before. I’m marking it and hope to try it soon. I love these posts! The onions look wonderful! It’s wonderful to hear that you enjoy these posts. I have a lot of fun doing them. We have a lot of flea markets around here, and I occasionally stop and look at old cookbooks. Maybe I’ll buy one sometime. It’s fun inspiration! I love browsing though old cookbooks. They not only have some interesting recipes, but they also provide so many hints about the culture, technology, and fads at the time they were written. And looking through them helps us remember parts of our culture that would otherwise be lost. My grandpa was born in 1916. Not only do I love the recipes you share, but I love looking at the dates on them as well. Thank you! It nice to hear that you like them. I also enjoy how some of the old recipes (though not this one) include the name and address of the contributor. It gives a sense of which foods were popular in which regions–and somehow makes me feel more connected across time with the cooks who originally made the recipes. Wow! That’s really neat. I never looked at that way. I’ll pay more attention to old recipes now. Thank you. Baking dripping OR olive oil. How unusual. I did not think that olive oil was used much by non-Mediterraneans much before the 1950s. Olive oil was definitely used in the US in the early 1900s–though as you said, it may have been used more by immigrants from southern Europe than by those of other origins. I even did a post with an ad for olive oil awhile back. I will check this out as it is an interest of mine – the history of food. They are pretty, but I am probably one of the few folks who does not love onions. I imagine they would make a roasted leg of lamb look pretty spectacular, though. mmm. . . this would be perfect with leg of lamb. Even though you don’t like onions, you have a wonderful sense of which foods work well together. Your comment makes me want to experiment with the gravy. I ended up with a relatively small amount of gravy–not really enough for a nice sauce over meatloaf, though I think that it would taste wonderful. . . . hmm. . . Maybe add a little more flour to the drippings (in addition to the flour that mixed with the drippings when the onions were rolled while cooking) and more water. I think that you would like it. I’m not a huge onion fan, but I think an onion cooked in bacon drippings could make me a convert! The bacon drippings do add a nice flavor to them. I love these old recipes! Thank you! It’s nice to hear that you like them. I have a lot of fun pulling these posts together. I never head this type of recipe before, so I must change that! I think that you’d like it. It’s an interesting recipe. Yes & a good challenge! OMG! This recipe is right up my alley. I LOVE onions, and manage to eat ‘some’ every day. Can’t wait to try it!